Cook officially signs her letter of intent to play college basketball at Trevecca Nazarene University Wednesday afternoon. South Webster senior Maddie Cook with her parents on her signing day Wednesday afternoon. 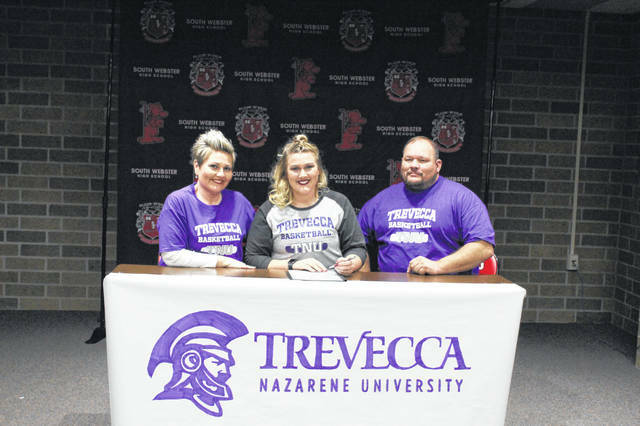 For South Webster senior Maddie Cook, her college choice of Trevecca Nazarene University in Nashville has just as much to do with the lifestyle Trevecca can provide, as well as the opportunity to play collegiate basketball. Trevecca Nazarene University is a private Christian liberal arts college in Nashville, Tennessee and was founded in 1901. The Trojans compete in the NCAA Division II ranks and are a member of the Great Midwest Conference alongside other schools in Ohio such as: Tiffin University, Ohio Dominican University, Walsh University, among others. 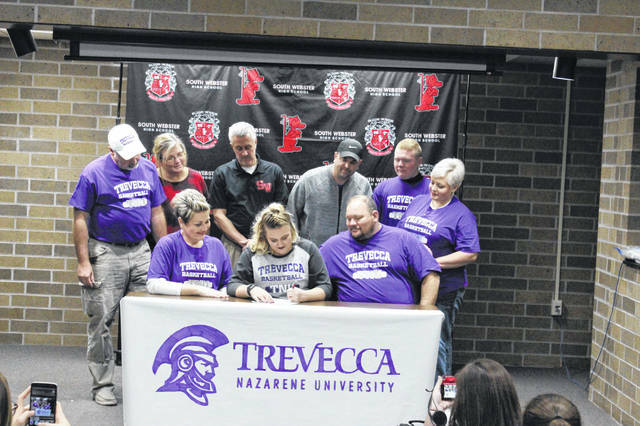 Cook believes that her playing style will fit in very smoothly to the game plan of her coaches at Trevecca when she begins attending next Fall. The Lady Jeeps will have to adjust to life after Ellie Jo Johnson an, a four year starter at South Webster, a third team all-state honoree during her senior season, and current member of the Morehead State Lady Eagles basketball team, and also former head coach Kristie Johnson who led the Lady Jeeps for the last twenty seasons. But for Cook, she’s going to make the absolute most of her senior season and final year at South Webster. The Lady Jeeps will begin their first season under new head coach Ryan Dutiel on Saturday November 24th when they will host the Glenwood Tigers. JV play will begin at 6:00 p.m. with varsity shortly to follow.